Yesterday was a whirlwind of crazy. I'm usually very ahead of my game when it comes to planning, but somehow I ended up at grocery stores the week of Christmas. Specifically, FOUR grocery stores, for different things. We accomplished a lot using my "surgical strike" grocery shopping technique, but thankfully, that's all over now. At least one of the guests tonight is vegan. I had been listening to the most recent episode of The Knit Wits Podcast (which is funny even if you're not a knitter), and Carin mentioned a vegan strawberry "cheesecake". 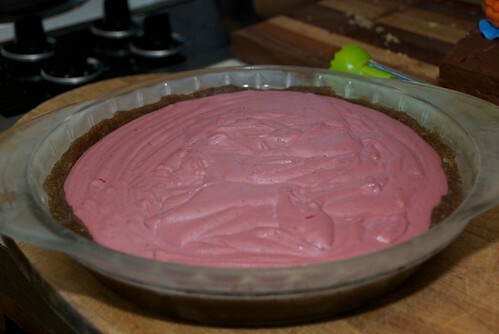 She was kind enough to share the recipe on their forum group, and so, a vegan strawberry cheesecake I made. It's remarkably simple- basically throw two sets of stuff into your food processor (or in my case, Laura's food processor, which I have on loan this week), freeze, eat pie. It's pretty tasty, but you can't think "This is going to taste like cheesecake." Instead think, "This is a delicious vegan dessert," and you'll like it a lot. After I made the vegan cheesecake, I looked at it and wondered if I should do something else. After all, the prep took about 10 minutes, and I wasn't sure how many folks would be attending. 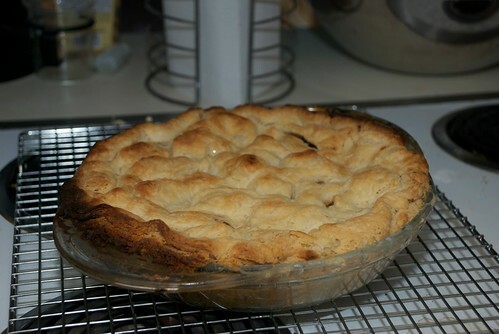 I called our hostess, and let her know that I had the ingredients for an apple pie as well, and could easily throw one together. She let me know that a homemade apple pie wouldn't go to waste, so with my handy sous chef (Mom), we threw that pie together in a half hour. In one hour, we had (mostly) made three desserts. The house smelled incredible, and had that special kind of warmth that only an oven can provide. Now, the tough part is waiting for tonight's festivities before cracking into them. I think the only way to do that, is to bake cupcakes. Thank goodness we picked up that 50 lb bag of flour yesterday . I enjoy baking around the holidays, but I've never tried it as a team endeavor! Hope your desserts turn out yummy and look forward to hearing how the vegan dessert tastes.